The supporting structure for overhead lines is required to keep the bare conductors at a suitable level above the ground. These may be various types of poles or towers. High mechanical strength in order to withstand the weight of conductors and wind loads etc. Light in weight so as to ease the transportation. The choice of line support for a particular case depends upon the line span, x-sectional area, line voltage, cost and local conditions. The rail poles are of the shape of track used for railways. Tubular poles are of round x-section generally having three diameters for 1/3rd of the length of the pole and rolled steel joists are of ‘I’ cross-section. These poles possess greater mechanical strength and thus permit the use of longer spans (60 to 80metres). These poles have the longer life (more than 40 years) which can further be increased by regular painting. At the bottom (the portion which is buried underground), these poles are set in concrete muffs in order to protect them from chemical reactions. Tubular poles having a height of 9 to 11 meters are generally used for distribution purposes in the cities to give better look. The steel rail poles in height of 11 meters to 13 meters are used for 11 kV and 33 kV lines respectively. However, these poles are very costly and require painting. The reinforced cement concrete poles have greater mechanical strength, longer life and permit longer spans (80 to 200 meters) than steel poles. These poles also give a good outlook, require little maintenance and possess better insulating properties. Therefore, these poles have become very popular in recent years. The main drawbacks with these poles are that these poles are very heavy which increases the transportation cost. They also require extra care in handling and erection. However, it is preferred to manufacture these poles at the site to avoid heavy cost of transportation. These poles are two types in shape. One type is of the square cross-section from bottom to top but sides of square decreases from bottom to top. The other type has the rectangular bottom and square top. These poles generally have rectangular holes throughout their length to facilitate the climbing of poles and reduce the weight of poles. In practice, the steel tubular poles and R.C.C poles are usually used for distribution purposes and steel rail poles as well as narrow-base lattice steel towers are used for 11 kV and 33 kV overhead lines. 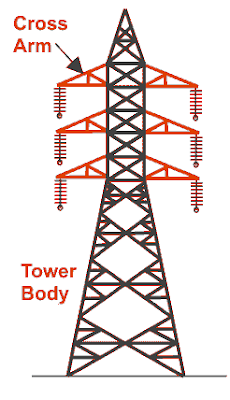 The broad-base, lattice steel towers are invariably employed for transmission lines operating at 66 kV and above. The steel towers have greater mechanical strength, much longer life, can withstand most severe climatic conditions and permit the use of longer spans (300 meters or above). These are much useful for cross fields, valleys, railway lines, rivers etc. Single Circuit Tower for the Transmission Line. Double Circuit Tower for the Transmission Line. In the case of double circuit towers for transmission line when a break down occurs one circuit is possible to carry out repairs while maintaining supply by the other circuit. Thus, the double circuit ensures the continuity of supply. #3 By which of the following methods voltage of transmission can be regulated ? Any of the above methods. #4 Which of the following distribution systems is the most economical ? #5 Which of the following is the main advantage of AC transmission system over DC transmission system? Less losses in transmission over long distances. step up as well as step down the voltage. #7 Which of the following bus-bar schemes is the most expensive ? 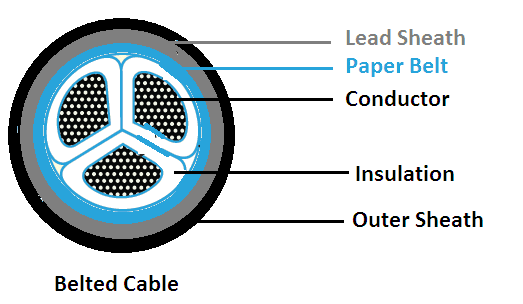 #8 By which of the following methods the protection against direct lightning strokes and high voltage sweep waves is provided ? #9 In which of the following voltage regulators the effect of dead zero is found ? #11 Which of the following has least effect on corona ? #12 In context of corona, if the conductors are polished and smooth, which of the following statements is correct ? Corona glow will not occur. #18 On which of the following does the size of a feeder depend ? #19 Which of the following are connected by the service mains ? #20 In the design of a distributor which of the following is the major consideration ? 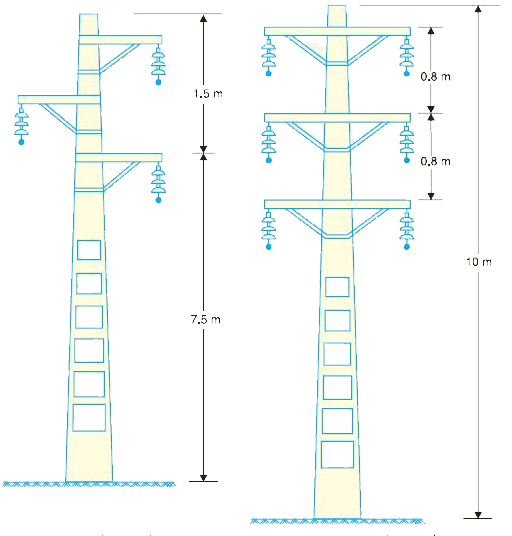 © https://yourelectricalguide.com/Poles | Towers for Transmission Lines.